Using ESO's 3.5-m New Technology telescope (NTT) located at La Silla (Chile) and the SuSI2 and EMMI instruments, astronomers from France and the USA  studied in great depth this unusual region by taking the highest resolution images so far as well as a series of spectra of the most prominent objects present. N214C is a complex of ionised hot gas, a so-called H II region , spreading over 170 by 125 light-years. At the centre of the nebula lies Sk-71 51, the region's brightest and hottest star. At a distance of ~12 light-years north of Sk-71 51 runs a long arc of highly compressed gas created by the strong stellar wind of the star. There are a dozen less bright stars scattered across the nebula and mainly around Sk-71 51. Moreover, several fine, filamentary structures and fine pillars are visible. 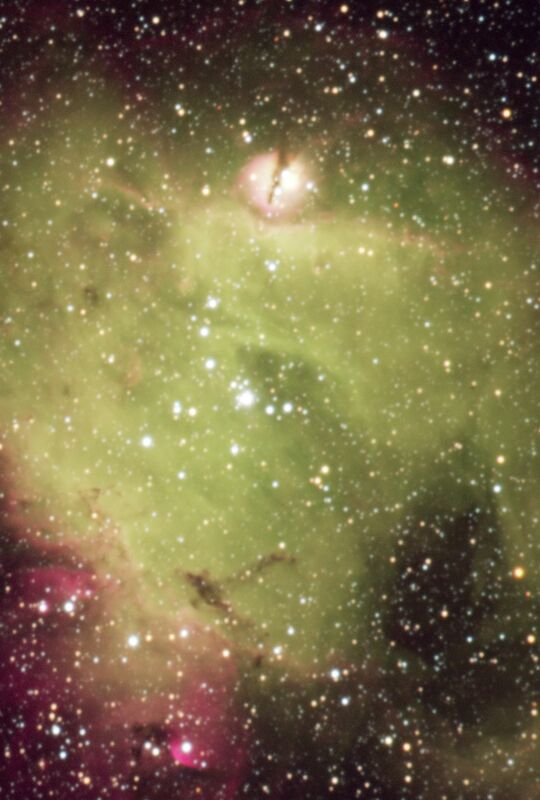 The green colour in the composite image, which covers the bulk of the N214C region, comes from doubly ionised oxygen atoms  and indicates that the nebula must be extremely hot over a very large extent. The central and brightest object is not a single star but a small, compact cluster of stars. In order to study this very tight cluster in great detail, the astronomers used sophisticated image-sharpening software to produce high-resolution images on which precise brightness and positional measurements could then be performed. This so-called "deconvolution" technique makes it possible to visualize this complex system much better, leading to the conclusion that the tight core of the Sk-71 51 cluster, covering a ~ 4 arc seconds area, is made up of at least 6 components. From additional spectra taken with EMMI (ESO Multi-Mode Instrument), the brightest component is found to belong to the rare class of very massive stars of spectral type O2 V((f*)). The astronomers derive a mass of ~80 solar masses for this object but it might well be that this is a multiple system, in which case, each component would be less massive. A remarkable feature of N214C is the presence of a globular blob of hot and ionised gas at ~ 60 arc seconds (~ 50 light-years in projection) north of Sk-71 51. It appears as a sphere about four light-years across, split into two lobes by a dust lane which runs along an almost north-south direction. The blob seems to be placed on a ridge of ionised gas that follows the structure of the blob, implying a possible interaction.